Following the success of Snapchat stories, Facebook wanted to bring their own version of stories which was introduced in Instagram not too long ago and now it has decided to bring the similar feature to its most used messaging app as well. WhatsApp has just launched a new tab that lets users share decorated photos, videos and GIFs that vanish after 24 hours. 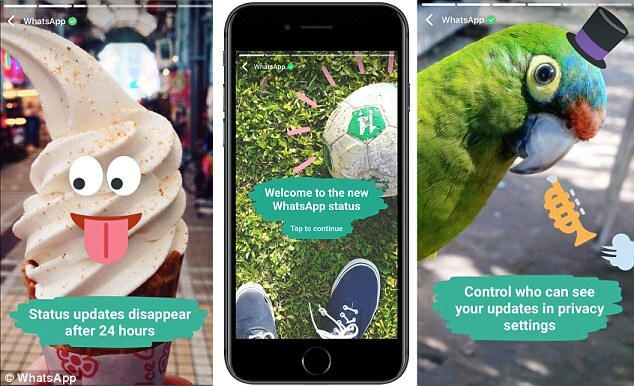 The featured titled “Status” is WhatsApp’s way of moving away from a traditional messaging app and more towards a social networking hub. All the messages would be end to end encrypted, a feature that WhatsApp is usually well known for. ‘Status’ was first revealed as an experimental feature in November when screenshots surfaced of the app on an Android device showing the tab between Chats and Calls. The new feature lets users scribble on images or add text and emojis – just like Snapchat. The update has already started to roll out on most devices starting from today so if you guys want to give it a try, update your apps today and is available for both Android and iOS devices.